SUMMARY: The unstructured Newsgeist LatAm revealed the topics that were top-of-mind for local media professionals, including video, podcasts, paid content models, and solution journalism. This community of industry peers shares projects and ideas, and tackles challenging problems together. The event had no pre-agenda, and all the subjects and challenges discussed were decided by the participants on the first night. After a short discussion, sticky notes started to cover a wall with hundreds of concerns shared from all of us publishers. 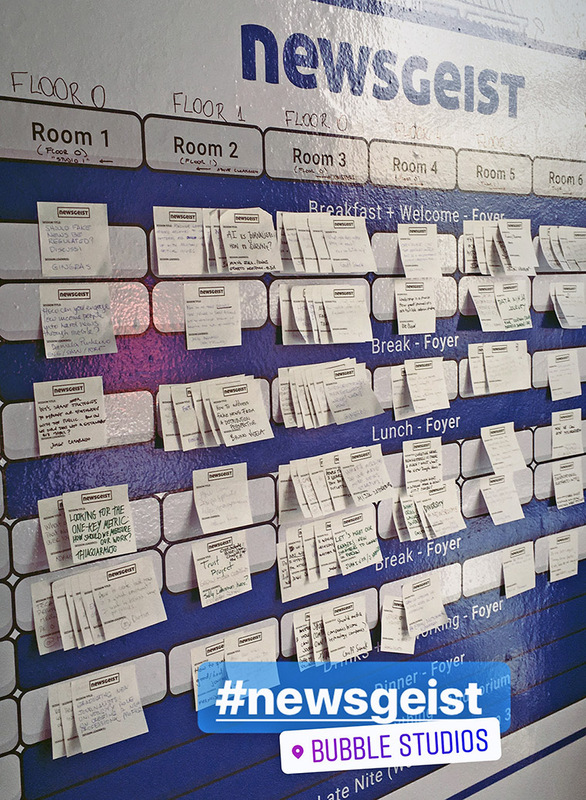 The flexibility of the Newsgeist event allowed media professionals to discuss those topics that most concern them. Based on principles of Design Thinking, the first session quickly dove into a series of structured questions, then tapped the experience and imagination of participants through a structured brainstorming exercise. There were 56 different questions ranging from business-model issues to journalism concepts and newsroom processes: Should fake news be regulated? How do we make long-form journalism cool again? How can design sprints help journalism? How should we measure our work (what is the key metric)? Every structured brain-storming session was designed to surface dozens of potential approaches to difficult problems or pending opportunities. Google was there in all of it, with engineers and media partners, with eyes wide open. 1. What role does video play in news? It wasn’t a surprise that a YouTube representative led the discussion. For all of us who participated, the big challenge was still audience engagement, especially related to news content and monetisation. With the 1.5 billion hours watched on YouTube every day, just 1% is news content. Still, the number is gigantic and an opportunity for us. Surprisingly, longer videos are doing better. Some participants shared their good experiences and results on how-to content, evergreen videos, and first-person stories. The question of whether video is even good for publishers was posed during the session. The question received no answer, but showed the challenges are really on the table. No one is making extraordinary money. The time spent is still too short and the ROI is not paying off, at least for news publishers. At least that’s the situation right now. 2. How we can make podcasts more popular in Latin America? Latin America is different from other parts of the world in that the LatAm community does not truly engage with podcasts. Even the publishers don’t know where to start. Because production volume is low, so is consumption. Distribution is still a big concern, since iOS has a good platform but the majority of people are Android users. Besides, LatAm publishers haven’t yet found the real value proposition of podcasts — the majority are still doing “just” radio. No one is investing in specific formats or storytelling innovations. Understanding the medium is an important part of it. One participant reminded us that hearing is our first developed sense, and we need to produce more focusing on the user, personally and emotionally speaking. The products must be appealing to one — and then it might reach the masses. A few tips from Radio Ambulante, which shares Latin stories in audio form from NPR, are to connect the episodes, not go longer 55 minutes, and measure the performance (it uses Splunk). But being consistent with publishing is what can really help to create the habit. And then you may get some engaged listeners. 3. Related to subscriptions, memberships, and paywalls: Which? When? How? This session was by far the most crowded. Almost everyone in the event was there to get the million-dollar answer. The bummer is we didn’t get it. But some insights were useful to the LatAm community. First of all, we all need to find what kind of content our users are willing to pay for. Knowing that can help design the value proposition: is it exclusive? Is it breaking news? Does it have social value? One idea that emerged was to try to measure the impact of our journalism and use it as an approach to get subscribers or members. For example, one Google engineer suggested taking a deep look at our landing pages. We are normally offering just the price — not the opportunity to be part of our mission. 4. When it comes to solution journalism, how do we move from watchdog to guide dog? This was one of my favourite sessions, because I’m already enthusiastic about the subject. Solution — or constructive — journalism wants to resolve the negative mood around us without being naive. It’s not meant to turn our faces toward the bad reality but to help make it better. It’s impossible to do this without engaging the users and the newsroom. At GaúchaZH last April, we launched a project I was happy to share at Newsgeist. “Um ano + alegre” is a series of 12 articles about how to help our readers help the community around them. Every month we unlock one more, which have a range of topics from how to be a volunteer to how to boost the local economy. Events are also organised by the newsroom and our marketing team to marry the online project with real-life action. The project goes until March 2019. We are trying not only to make Porto Alegre a better city but also help our users become better citizens. Even more good news is that the project got a sponsor. So, yes, solutions can also be monetised.